Customer's acceptance of this Proposal shall constitute the Contract for the performance of the work described. Purchase Orders or other Contract Forms received in lieu of this Contract will be regarded as acceptance of this Contract and all its conditions. Prices are based on job conditions being the "same" as those at time of inspection by Phoenix Industrial Contractors Inc. The term "same" will be solely determined by Phoenix Industrial Contractors Inc.
Payment is due upon completion of Contract, except for work extending beyond a one-week period, in which case, partial billing will be sent to Customer for work done up to that specified date, unless otherwise specified. Rates and prices are predicated upon prompt payment of invoices; accordingly, for amounts not paid within (30) days of invoice date 1.5% per month (18% APR), plus cost of collection will be added to the unpaid balance. While Phoenix Industrial Contractors Inc., is performing its duties under this Agreement, Customer agrees that until the total completion of the project, to protect all unfinished work, materials and tools on the site, and other appliances for the use or incidental thereto for the performance of this Agreement, whether furnished by Phoenix Industrial Contractors Inc., or Customer or from the elements and from all other kinds of damage which may be caused in any manner whatsoever. Customer shall be entirely responsible for any loss or damage done to said work, materials, tools, equipment, and other appliances in any manner aforementioned. Undue waiting time for trucks or trailers will be extra, billed at our regular rates or premium rates as may apply. Work performed to correct shop blueprint errors will be billed as extra at our regular rates in addition to the Contract price. Phoenix Industrial Contractors Inc., shall not be liable for delays in delivery due to causes beyond its reasonable control such as Acts of God, strikes, accidents, weather or other conditions. Should such a delay occur, Phoenix Industrial Contractors Inc., may reasonably extend delivery schedule without penalty or liability. Upon notice from Phoenix Industrial Contractors Inc., that equipment is ready for shipment/delivery, if for any reason Customer is not prepared to accept delivery and/or installation of said equipment, Phoenix Industrial Contractors Inc., may immediately cancel any and all Agreements and seek appropriate remedies. Moreover, interruptions to work on a contract job where Phoenix Industrial Contractors Inc., must move OFF and ON the job for Customer convenience, or due to delay of delivery of material, will be billed as an extra service at regular rates in addition to the Contract price. We will neither furnish nor perform the following work: electrical, mechanical, hydraulic, piping, hook ups or disconnects, leveling, anchoring, grouting, concrete work, painting, fabricating or crating disposal, unless stated in quote. When necessary, the following (but not limited to) shall be furnished by Customer without expenses to Phoenix Industrial Contractors Inc: material for blocking, bracing, or skidding; shoring of floors, walls, buildings, or parts thereof. These customer supplied materials and equipment shall be of good quality and new unless otherwise specified. All materials and equipment provided by Customer not conforming to these requirements, including substitutions not properly approved and authorized may be considered defective. Customer is to provide adequate access & egress to job site. Additional work will be done on a time and material basis. 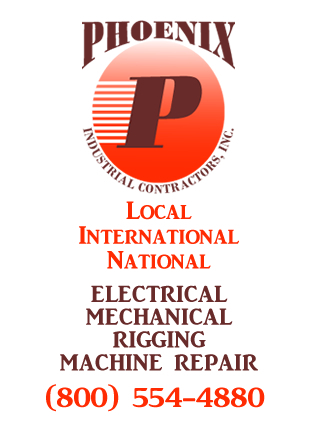 Phoenix Industrial Contractors Inc., shall not be liable for and Customer hereby indemnifies and holds Phoenix Machinery Movers Inc., harmless from any loss due to damage of any nature to driveways, finished floors, walls, buildings, curbs, sidewalks, or parts thereof not adequate to support machinery and the equipment needed to complete the job. Unless Customer gives written notice within forty-eight hours after receipt of the equipment specifying defects or other objections, it shall be conclusively presumed between Customer and Phoenix Industrial Contractors Inc., that Customer has fully inspected the equipment, that it is in full compliance with terms of this Agreement, is in good condition and repair, and that Customer is satisfied and has accepted the same. Customer shall indemnify, hold harmless and defend Phoenix Industrial Contractors Inc., its employees, agents, and representatives from and against any and all losses, damages, expenses, claims, suits and demands of whatever nature, resulting from damages or injuries including death and lost profits, to any property or persons, caused by or arising out of any action, omission, or operation under this Agreement or in connection with the work attributable to Phoenix Industrial Contractors Inc., its material men, employees, agents or representatives, provided however, that the Customer shall not be required to indemnify Phoenix Industrial Contractors Inc., its employees agents, and representatives hereunder for any damages or injuries including death, to any property or persons, caused solely and exclusively by the negligence of Phoenix Industrial Contractors Inc.
Workmen's Compensation, Public Liability Property Damage and Cargo Insurance(s) are carried by Phoenix Industrial Contractors Inc. Certificates of Insurance will be furnished upon request. All notices or other communications required by Customer pursuant to this Agreement shall be in writing and shall be delivered personally or sent by overnight courier, by facsimile with confirmation or by registered/certified mail return receipt requested. Any waiver of any right, power or privilege hereunder shall not operate as a waiver of any other right, power or privilege hereunder. This Agreement may be executed in any number of counterparts, and by the parties in separate counterparts, each of which shall be an original, but all of which shall together constitute one and the same Agreement. If there is not a signed quote returned: Any authorization, consent or notice to proceed work (oral, email, phone call, text message, purchase order) is unequivocal acceptance to our terms and conditions. This agreement is governed by Michigan law and any action to enforce it must be brought in a state or federal court physically located in Michigan.